Production and Labour Minister Dante Sica on the economic downturn, the motors for recovery in 2019 and what sectors the crisis hit hardest. Production and Labour Minister Dante Sica welcomed Perfil journalists Jairo Straccia dn Patricia Valli for an exclusive interview, just a few days after the turn of the year. Let’s split up gross domestic product into thirds. One third did not fall throughout the year despite the crisis – fisheries, knowledge services, the energy sector, meat [beef, chicken or pork], telecommunications, tourism, etc. That third accounts for a quarter of all jobs. Then you have 30 percent of GDP which slumped all year – agriculture [due to the drought] and textiles, footwear, leather, food, metal and engineering and ancillary construction industries. But they account for 37 percent of jobs. That’s where it’s felt most, especially in the industrial sector. And then you have a third of activities which made a very strong start and then fell off or slowed down such as construction. You tell me which sector and I’ll tell you how you passed the year. If you go to Neuquén, you had a great year but in La Matanza or Florencio Varela odd jobs and the building industry fell off while light engineering suffered. Is that a problem of a model which does not favour labour-intensive sectors? No, I don’t think it’s the model, rather the impact of the crisis. What are the motors for recovery in your view? You are going to have sectors acting as tractors for continuing or returning to growth. One is farming, due to climatic factors. And then there are the export industries. Many sectors previously geared to the domestic market which always clamoured for protection will have overseas markets to compensate for the fall of the domestic. Furthermore, as from last month following the collective wage bargaining of September and October, aggregate income will begin to outstrip monthly inflation in real terms, which alongside a stable dollar, will bring about a recovery of consumption. What would you say to workers who have lost their jobs in Greater Buenos Aires? That they retrain to return to their industry or that they look elsewhere for other options in places like Jujuy or Neuquén? There’s no single reply to that question. Some programme is needed for those families losing their jobs, a process of retraining. On average 22 families are moving to Neuquén every day, both for the wells and due to the intense demand of accompanying services. The same’s going to happen in the north with the lithium. Demographic mobility in Argentina until now has been from the hinterland to Greater Buenos Aires due to low job demand. And you’re saying that’s going to be reversed? My feeling is that somebody coming from a northern province, thinking that he would find more work in Greater Buenos Aires or the Federal Capital, will now start realising that there are job niches which they did not have before and that it would cost them less to go home than for somebody from Merlo to move inland. Many companies are suspending workers or bringing forward vacations in the hope of seeing through the summer. Is another wave of lay-offs on the way? If you look at services, job creation has only started slackening off over the last month while construction trends were positive in the first five months of 2018. Today the provinces have fiscal surpluses and a greater capacity for public works than the national government. Those sectors in the middle and upper classes who dollarised their savings are now better-off. The worst effect was on industry. Until 2015 you had a closed economy where many imported consumer products were not available and many industrial sectors enjoyed above-average growth from supplying, imperfectly, what could not be brought in from the outside world. These companies became increasingly less competitive. You might say that that they were sustained by a model privileging labour-intensive industry. Pure fiction with no real sustainability. It was maintained by subsidies which ended up generating problems for the energy sector as well as inflation. Today, in Vaca Muerta, you pay the oil companies seven dollars for gas worth four to stimulate production. That also sounds a bit fictitious. Yes, but it’s part of a process of normalising prices and there are also technological changes. You said that wages were already starting to outstrip inflation last month but aren’t the utility bill increases heating up the cost of living? Those increases have an impact on regulated prices but core inflation is stabilising and receding. Perhaps the approximation between core and overall inflation will slow down in this quarter due to regulated prices. But monthly incomes should move ahead of inflation. But a fall in consumption is forecast for 2019? I think that still remains to be seen. The negative lag effect will be high, around 2.7 percent, with a slow start to this first quarter. Within a framework of exchange rate stability and real wages commencing their recovery, consumption is recovering amid greater job stability and pickup for services and construction – credit will then follow when the Central Bank has more margin to lower interest rates and assist the recovery of consumer credit. All your forecasts are premised on the dollar remaining stable. What if it doesn’t? We now enjoy better macroeconomic conditions than a year ago, after lowering the deficit and moving towards a balanced budget, thus eliminating one of the main causes of inflation, which was printing money to fund that deficit. We already have 2019 financed and I would say 2020 as well. And if you look at debt renewal in pesos, we are also pre-financing 2021. Our exchange rate policy makes for greater predictability. We have lowered the deficit in the balance of payments and completed most of the correction of relative prices. It’s a risk we have to face. As the elections draw closer and the opinion polls begin to show firmer tendencies, the position will improve and that should surely not be something which will affect us. You’re the Production and Labour minister. The data for both production and employment are worse than in 2015. Why should a Cambiemos (Let’s Change) voter from 2015 re-elect you? It’s not all about whether production rose or fell by magic as the result of two sets of policies. We are working to restructure the economy which was never done in the last 30-40 years. The crisis hit us and caused demand to fall but from a structural standpoint we are more competitive today than in 2015. Production and Labour Minister Dante Sica also spoke of wage guidelines for 2019. He said that in a scenario of price stability he would prefer a review clause rather than automatic increases if inflation outstripped wage hikes. Is there a wage cap [for 2019] of 23 percent? We do not have inflation targets, basing our discussion of wage guidelines on each sector’s capacity to absorb pay increases. A trade union can always ask for, say, 45 percent but if the sector accepts this and then cannot absorb it into its profits or pricing, there will be an impact on employment. Before negotiating, any business talks to the consultants or at least that was my previous experience. They look at the market expectations as compiled by the Central Bank (REM) and at the budget and on that basis decide whether to export or attend the domestic market. Everybody will look at what suits them. And the trade union will also look at the two variables, wage and employment levels. Given price stability, we would prefer a review clause rather than automatic increases if inflation outstrips wage hikes. If you sign in January, you can insert a clause for review after six months. Do you intend to advance with labour reform? The labour reform issue is like a huge text without any defined content. As a society and as a government, we have to discuss questions bearing on the future of employment, industrial relations and production. The forms of production are changing at a rapid pace in today’s world. We also face the short-term challenge of informally employed workers without social coverage. Talks at sectorial level are a good indicator towards starting to break through the mistrust of those who believe that reforms conspire against acquired rights or those who blame norms against which they feel helpless. But will a bill be sent to Congress? I aim to advance with sectorial agreements. But with 30 percent of workers informally employed, I’m obviously going to try and insist on a law to legalise their situation as an issue of social justice. I cannot remain silent. Does sending trade unionists to jail help you to advance with labour reforms to cut costs? The key is to clean corruption out of all systems. The more transparent and stable the ground rules are, the more productivity can be improved. 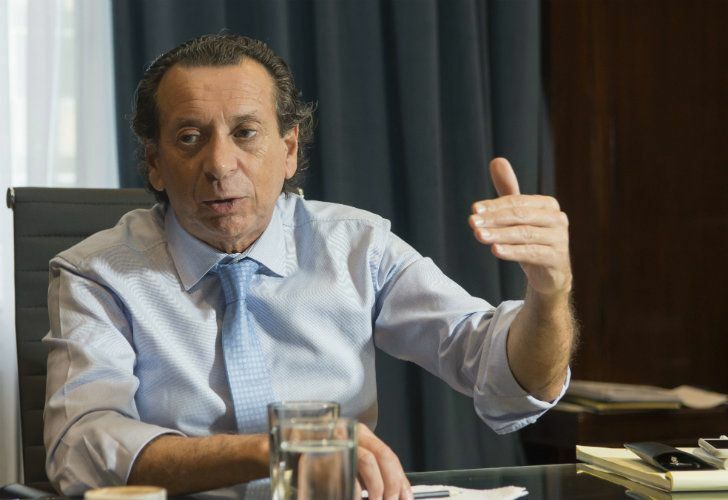 Production and Labour Minister Dante Sica says he is enthusiastic over Brazil’s new economic direction under the leadership of new President Jair Bolsonaro. Sica said he believes Argentina’s giant neighbour will grow more, thus aiding the domestic recovery. The region has been shaken up by Jair Bolsonaro coming to power in Brazil. How does the government see it? We have great expectations of the first official meeting [on January 16] with Argentina’s president also presiding over the Mercosur. We have ongoing negotiations which should be concluded in the first few months of this year. What’s your reaction to Bolsonaro, enthusiasm or concern? Enthusiasm. All the projections show growth prospects on an upward curve for Brazil after last year’s recession and mediocre growth. This year’s growth could reach three percent. If Brazil grows, its demand will pull us up. We are hopeful. Not because of Bolsonaro but because of the important administrative changes already made. We would like to know his agenda, which, from everything we have heard, does not differ much from our own advances in these last few years. How can you separate the controversial aspects of Bolsonaro in areas beyond the economy from his economic management as such with respect to Argentina? What we have to look at is the economic side. Beyond that there is a whole range of issues with which we might agree or disagree. Was President Macri’s no-show at the inauguration a political gesture or was he just taking a rest? There was no formal invitation to the president to attend and the Government decided to replace him with Foreign Minister (Jorge) Faurie. One of the main links with Brazil is the automobile sector. What are its perspectives? Brazil’s recovery will have its impact on the sector. By the close of 2018 Brazil had licensed 2.6 million new cars with almost three million estimated for this year. Around 7 to 8 percent of Brazil’s total is Argentine, thus offering perspectives of improvement. With 18 pesos a dollar you had more cars coming in. There were forecasts of a million new licences for 2018 but the final figure will be 700-800,000 cars, 70 percent coming from Brazil and 30 percent produced by the local market.